I seem to be spending more and more time editing photographs in strange places. Last weekend it was in a tent on The Mall – right by Buckingham Palace. The weather forecast predicted bright sunshine so I decided that I needed to replace my very old plastic laptop sun shade with something a bit more ‘state-of-the-art’. 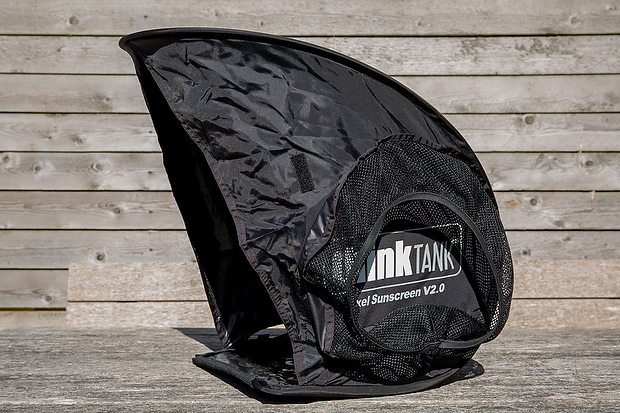 Looking around it quickly became clear that the Think Tank Pixel Sunscreen V2 was the most likely to fulfil my needs so I went down to Fixation to buy one. Before I parted with my money I made sure that I could fold the thing away and the handy instructions printed on it made it very easy to do. Basically, if you can fold a Lastolite or a small tent, this is a doddle. There followed two very long days editing with a team of great photographers covering the Prudential RideLondon events in a white tent which was, for the most part, in direct sunshine. My 13″ MacBook Pro disappeared into the sunscreen pretty early on in the mornings and didn’t come out again until well into the evenings. That made for a very full-on test and having laid my own money down the previous day I hoped that I’d made the right decision. When you see the unit opened up (and it opens very easily) it appears to be rather tall and the shape doesn’t look like any other sun shade that I have ever seen for a laptop. Sitting working with it for only a few minutes you realise that the height and depth of the hood makes sense and working with it was nowhere near as awkward as my previous hoods. No need to stoop or bend and my spine was in a lot less danger than it would otherwise have been. It isn’t as comfortable as using the laptop without the hood but it appeared very quickly to be a great compromise. Typing captions and other text based activities were fine. I had a very dark shirt on and so barely saw my own reflection in the screen. When it came to preparing images I was forced most of the time to use the lightweight black cape that comes with the sunscreen and attaches with velcro tabs and actually get inside. The three pictures below are an attempt to show what using the screen actually means. As long as there’s no direct sunshine hitting the laptop screen you can happily work away. The centre picture shows how bright the sun was when took these pictures to illustrate how effective the Sunscreen is and the third picture shows how clearly and easily you can see the screen when you are ‘inside’ the caped unit. Being inside the screen with the black cape draped over you can get a little stuffy and even a bit warm but you really can see the screen properly – even if you are facing into the direct summer sun. So far I’ve mentioned lots of good things about this Think Tank product and over the two days I was using it I didn’t find too many faults but, in the interests of the V3 being even better, I thought that I’d share two niggles and suggest a couple of small design changes. The biggest flaw by far is the velcro hatch on the lower rear left hand side (as you are looking into it). There’s no way that the Apple MagSafe 2 power supply will stay plugged into the laptop when it is fed through the slot unless you use something about 2-3cm thick to stand the laptop on inside the shade. Most of the time that you are editing outside I would say that battery power is fine but for this event I had to plug-in. I found two strips of wood that my MacBook Pro sat happily on and all was fine. The way that the (very well made) seam of the shade is positioned in relation to the slot means that the slightest movement will disconnect the power supply because it cannot sit straight unless you raise the laptop. Somehow they need to create a slot that is less well engineered that overcomes this small issue because I don’t want to carry two strips of timber around with me. Whilst they are at it, it would make way more sense to have the velcro slot open from the bottom and not the top so that less light (which tends to come from the top rather than the bottom) or even go so far as to have a simple slit that you stick things through that gently holds the cable rather than this heavily constructed back door. My other minor niggle is the size and placement of the branding on it. Almost a third of the right hand side is made up of a massive Think Tank logo. More than one other laptop user on our team suggested that they would prefer not to be advertising a product if they’d paid for it in such an over-the-top way. 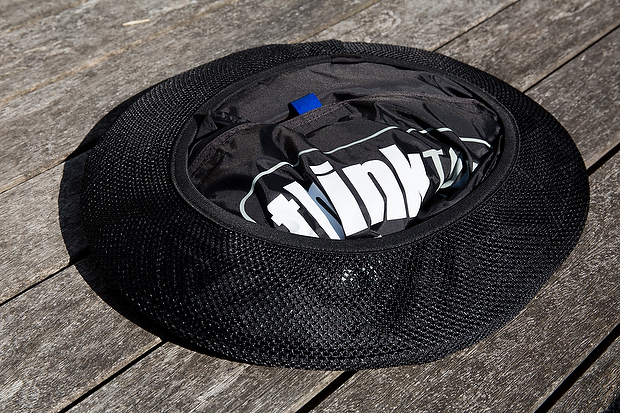 I came to agree with them once a few people had suggested that I must be sponsored by Think Tank. Back on the positive side there are lots of small pockets inside the hood and I found these useful places to stick memory cards that needed to be given back to people as well as to hold my Netgear Mifi unit which was there as a back up should the provided internet service have failed for any reason. The pockets don’t keep gear safe but it does keep it away from being out of sight when you are closeted away inside the editing bubble. Thinking that I would review the Sunscreen I tried a colleague’s 15″ MacBook Pro inside and, whilst it was a very snug fit, it passed the test. The MagSafe issue was probably worse with the larger screen – something that I’d need longer to confirm. After two days of very concentrated use I decided that this is a very good piece of kit. It is well worth the money and I predict that it will last for a few years too.